Elmo is the Official Dog Therapist and Greeter of Life Counseling Institute. 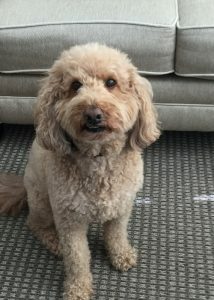 He’s a mini golden doodle and loves all our clients. He’s is scared of the wind and is pretty mellow. He’s been known to arrive at our office via his doggie bike trailer! Sign up for our newsletter for trusted advice and articles that are relevant to your journey to reclaim your life. Our newsletters rock. Literally! Click here to view our past newsletters, as well as view our Song and Video of the month! We are located in Willowbrook and frequently see clients from Willowbrook, Burr Ridge, Hinsdale, Lemont, Downers Grove, Lisle, Naperville, Woodridge, Darien, Aurora, Wheaton, Lombard, Glen Ellyn, Elmhurst, Westchester, Oak Brook, Western Springs, Countryside, Hickory Hills, Villa Park, LaGrange, LaGrange Park, Riverside, Oak Park, and Hillside. Counseling for individuals looking for help with life transitions, relationships, anxiety, depression, divorce, communication, alcoholism, addictions, codependency, stress, sexuality and career counseling.